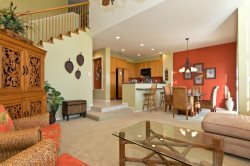 Every guest can sit back and enjoy their time together in this tropical 2-story “Island Style” condo that features three bedrooms, two full plus one half bathrooms. While you are here, you can enjoy playing golf at Waikoloa Beach Resort’s two championship golf courses. The Beach course and the Kings’ Course are both scenic layouts that can be challenging and yet pleasurable to play. The Kings’ Course driving range, clubhouse, and grill are within easy walking distance from your home. There are several other world class golf venues within easy driving distance, including at the Mauna Lani and Mauna Kea Resorts which are just north of Waikoloa. From the lanai of your Hawaiian “hale” (home), you will enjoy morning sunrises while overlooking the 15th green of Waikoloa’s Beach Golf Course, with the beautiful Hualalai volcano in the background. In the evenings, stroll the expanse of lush lawn adjacent to your lanai and enjoy the colorful Hawaiian sunsets while sipping your favorite island drink. Inside, the home echoes its wild and tropical surroundings with vaulted ceilings and extraordinary architectural elements. The living room is spacious and features a Bose surround audio system, flat screen TV and DVD/VCR. There is interactive digital cable television service with premium channel selections, and several children’s DVDs and island flavor CDs for your family’s enjoyment. High-speed wireless Internet is also provided for your convenience. On the upper level there is a master suite features a king-sized bed, walk-in closet, and a spacious bathroom complete with double sinks, marble counters and a separate soaking bathtub and shower. Also located on the upper level are two additional bedrooms with queen beds, a second bathroom, and a full-sized washer and dryer. Central air conditioning and ceiling fans throughout your home help create a comfortable living environment. Within the Waikoloa Beach Resort are two of the best shopping malls on the Kohala Coast. The Kings’ Shops and the Queens’ Market Place each offer unique shopping, dining, and free entertainment experiences that are sure to please. The large “Island Gourmet” market located at the Queen’s Market Place is a wonderful and welcomed recent addition to the Resort. The Hilton and Marriott Hotels at the Resort each offer great dining and shopping experiences as well. Clean, easy to find, stress free, had everything we needed- plenty of extra towels, pillows, linens, cookware! Our vacation ended up being on the same weekend as Hurricane Iselle so obviously there was anxiety and unexpected issues. Through it all, Anne Marie and the Resortica Staff were courteous, accommodating and answered all of our questions. They were two steps ahead of us which made our stay wonderful. We would definitely book again with Resortica. We did not need the services of anyone on the team while we were staying at this unit. We did, however appreciate the efficient manner in which the arrangements for our visit were handled. The efforts that your team made behind the scenes in providing us the information we needed to locate and access the unit made our trip more enjoyable. The unit was more like a home away from home than a short term residence. The rooms were nicely appointed and layed out in a way that allowed all of us to enjoy both private time and group activities. It was a comfortable refuge to return to at the end of a day of sight seeing when we just wanted to relax or spend time talking about our day or to plan the next day. I particularly liked the fact that it provided us with some privacy from the other residences when we wanted to have our own space. The property provided us with a quiet, comfortalbe location to relax when weren't out being "tourists". It was important to us to have both indoor and outdoor space where we could escape the noise and hustle and bustle of the busy resort area where the unit is located and yet be located close enough to the activity centers for us to be able to conveniently access them when we wanted. Everyone was outstanding!!! Alicia was extremely helpful with answering questions and making/changing reservations.